As a mom we wash our hands a lot so the soap you choose makes a difference on how your hands feel and how they get cleaned. I recently tried Dial’s new Boutique Collection Hand Soap. We specifically tried the Sugar Cane Husk Hand soap for but new line is featuring vibrant new scents, great moisture and gentle mico-scrubbers to reach all those scary germs you pick up from the kids and at the grocery store. They are pretty enough to have in your guest bathroom too. NEW Dial® Sugar Cane Husk Scrub Hand Soap is the newest member of the Dial® Boutique Collection Hand Soap line, bringing luxury to your hand washing experience. With an indulgent scent inspired by freshly cut Sugar Cane, this premium formula with gentle micro scrubbers cleanses deeply while moisturizing and smoothing skin. No more worries about dry hands, know that Dial has your back on both making sure your hands are clean and leaving them moisturized. Can’t wait to hear what your thoughts are on the Dial Products. So we have a wonderful giveaway just in time to fill your Easter Baskets or add some new spring decor colors into your bathroom. One lucky reader will win 3 full product Dial coupons. These are three different Dial Soap products so you too can try these wonderful products at home. Just enter to rafflecopter below. 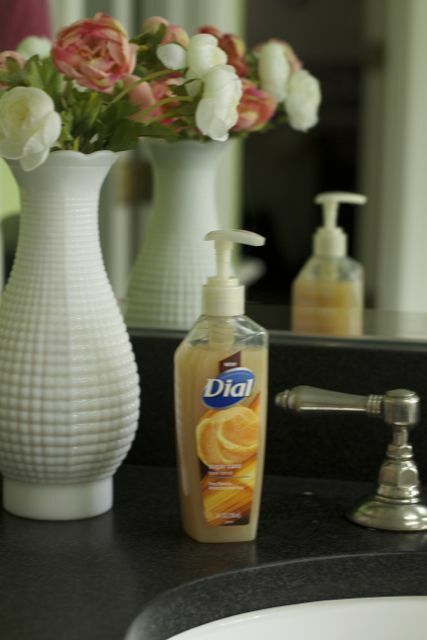 dial makes great hand soaps!